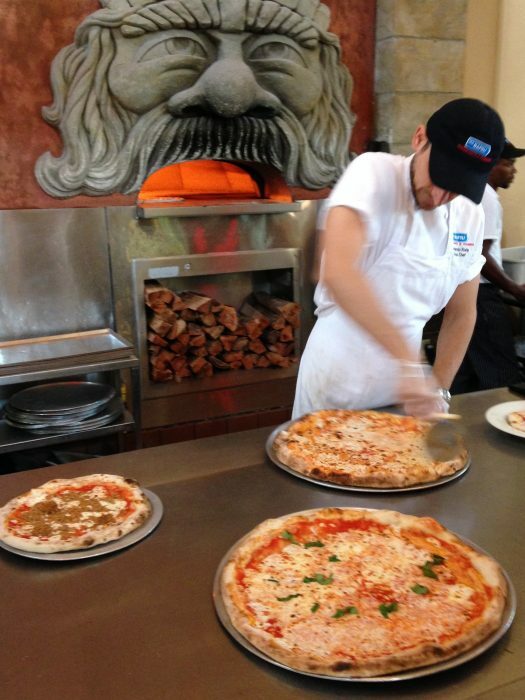 Via Napoli: Walt Disney World’s Best Pizza? 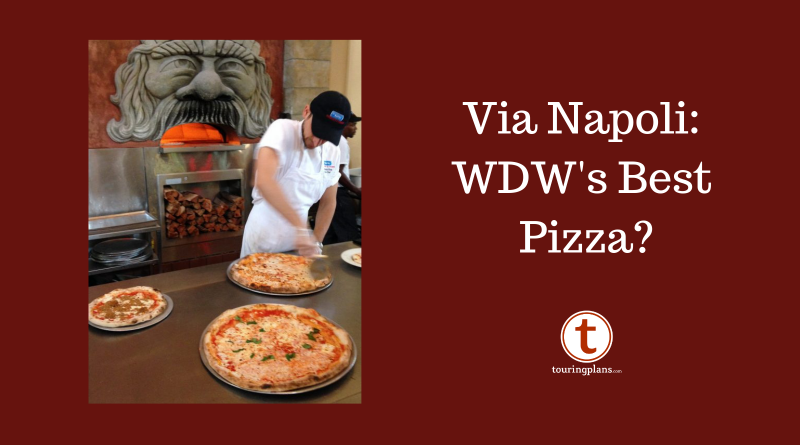 National Pizza Day was Saturday February 9 and while I certainly don’t need a special occasion to celebrate the joy of pizza, I nevertheless decided to take you on a journey to Epcot’s Via Napoli to mark the occasion. 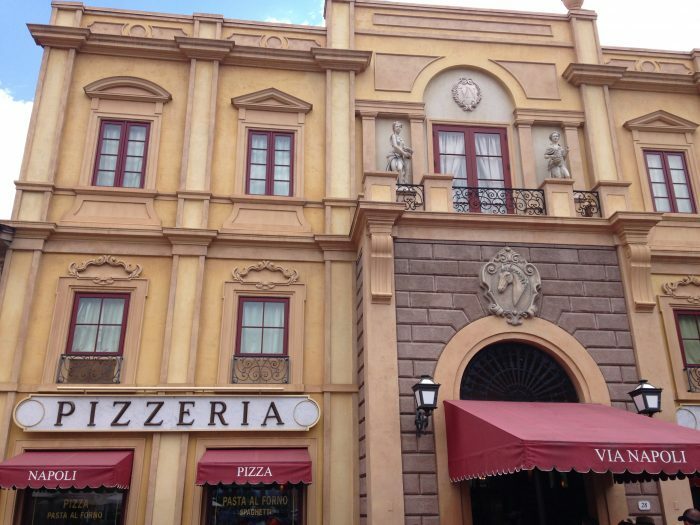 In the back of Epcot’s Italy pavilion is Via Napoli. The large building is an homage to styles across Italy and would look at home on both a piazza in Rome or in Medicean Florence. 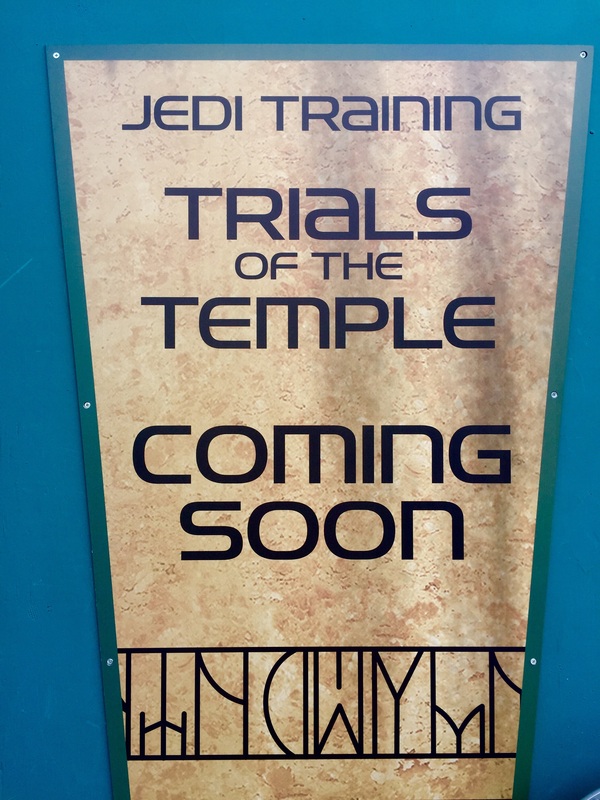 There is a very loose backstory involving an heir to a wealthy family turning their estate into two restaurants. Via Napoli’s sister restaurant Tutto Italia represents the family’s home and Via Napoli is the family’s country villa and stables. In actuality Patina, the outside restaurant group that is beginning to dominate the Disney dining scene, operates it. Patina is currently operating not only Via Napoli and Tutto Italia in the Italy pavilion but also The Edison, Maria & Enzo’s, and Morimoto Asia among others in Disney Springs as well as California’s Downtown Disney. Inside is a small waiting area with a hostess stand and behind it large glass windows and doors. These offer guests an enticing view of the expansive main dining room. 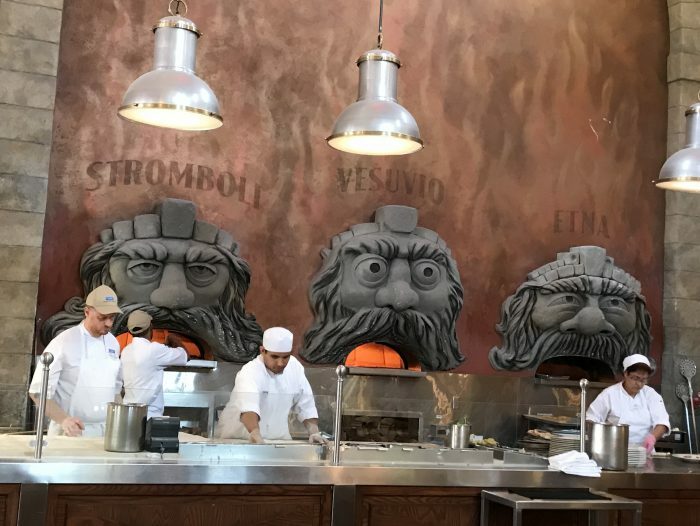 Once inside the dining room, however, the main attractions are the three gigantic pizza ovens paying homage to Italy’s famous volcanoes – Etna, Vesuvio, and the appropriate-for-the-cuisine Stromboli. Pizza chefs are hard at work assembling the pies in full view of guests here. This is always an enjoyable bit of mealtime entertainment for curious foodies like myself. Also in the main dining room is a large communal table. You may sit with other guests here so if this is not to your liking, feel free to tell a host or hostess and they will be sure to seat you someplace else. There are other dining rooms off to the sides. One features booths and four-person tables situated down a long hall along side of the building. Another room is a lovely patio that is open air or enclosed by windows depending on the weather. 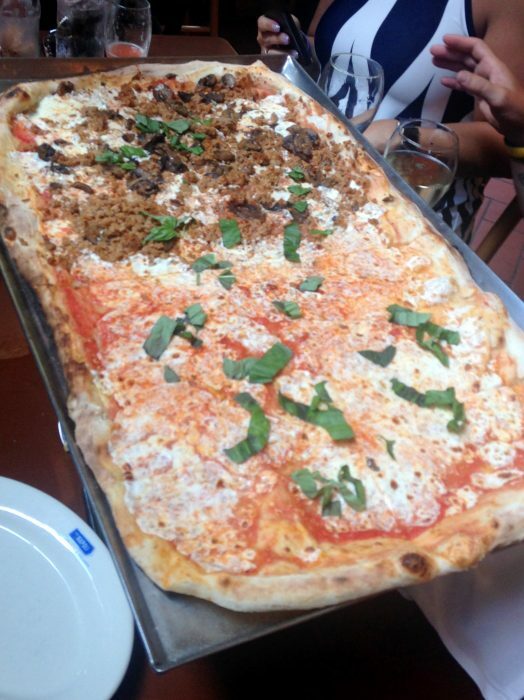 The large is roughly the size of a “normal” pizza and feeds 2-3. The 1/2 Meter (seen in the picture below) is a massive rectangular conversation piece that serves 3-6. Although, in my opinion, every pizza is a personal pizza if you try hard enough. The pizza is made from water that is either imported from Naples or calibrated to the exact pH level of that in Naples, depending on which version of the story you want to believe. Regardless, it is an outstanding thin crust that strikes the exact balance of crispy and chewy that you’re looking for in a pizza crust. 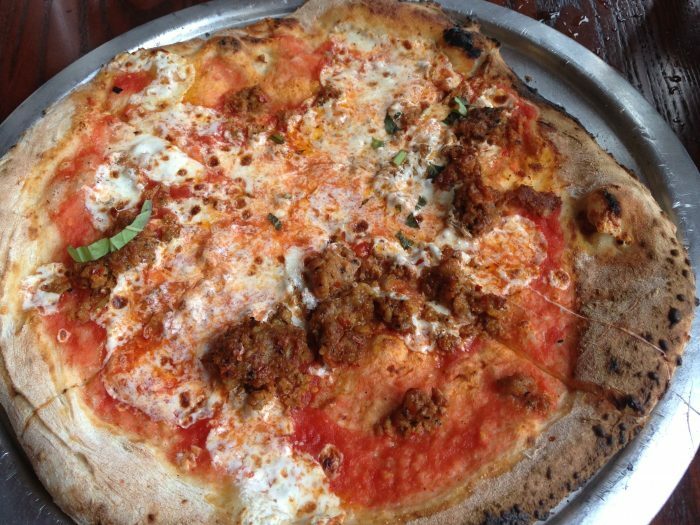 The wood-fired ovens also give a healthy does of charring to the bottom and edges of the crust. I find this delightful but younger and especially fussy eaters may not. There are a number of “signature” combinations on the menu including the traditional Margherita with tomato, basil, and mozzarella and Pepperoni with thick cuts of stick pepperoni – not paper thin strips from a bag. Other signature combos include the Picante with spicy Italian sausage; Capricciosa with eggplant, artichokes, ham, and mushrooms; and Prosciutto e Melone. This is an Italian take on the popular but divisive Hawaiian pizza. Here it features cantaloupe and Italian prosciutto ham. 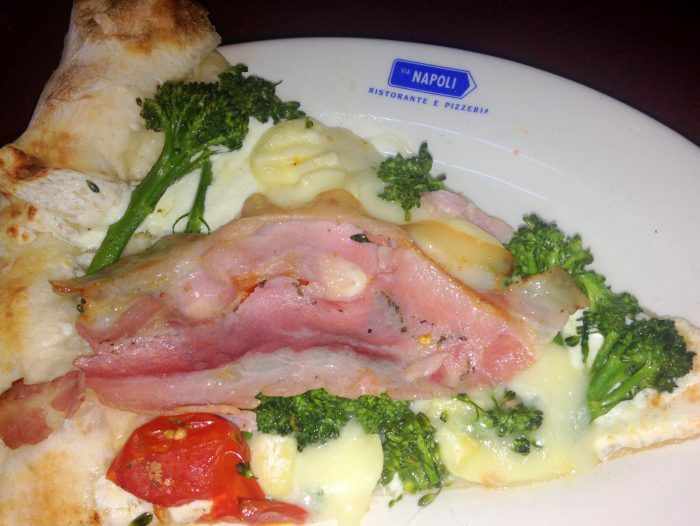 My personal favorite option is the Broccolini with cherry tomatoes, porchetta ham, as well as mozzarella and robiola cheeses. There are also a number of other sauceless “white” pizzas and the option to “build your own” in any size with toppings ranging from the traditional mushrooms, onions, and olives to less traditional panchetta, zucchini, and smoked salmon. 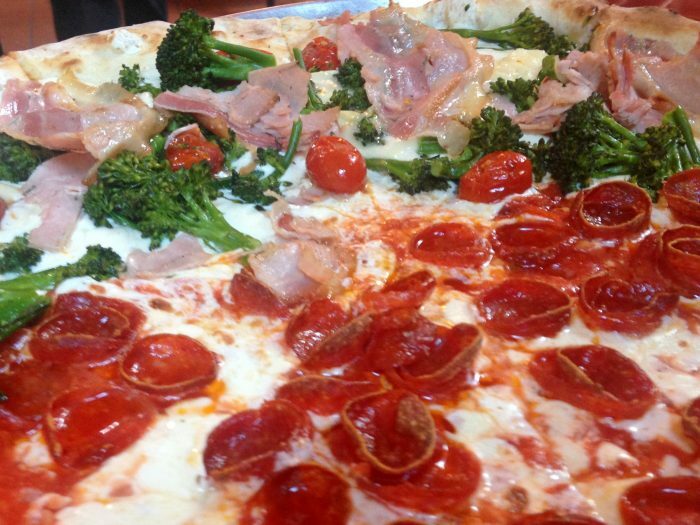 They will also mix varieties in large and 1/2 meter pizzas if you can’t decide which one to order. I would be remiss in not mentioning the beverages. Along with the usual Coca-Cola products are fresh brewed iced tea, Italian still and sparkling water, Italian sodas, and specialty coffees. On the alcoholic side, there is an extensive wine list and a variety of specialty cocktails including a Limoncello Mule and house Sangria. In my opinion, nothing pairs better with pizza than beer and Via Napoli has that too. 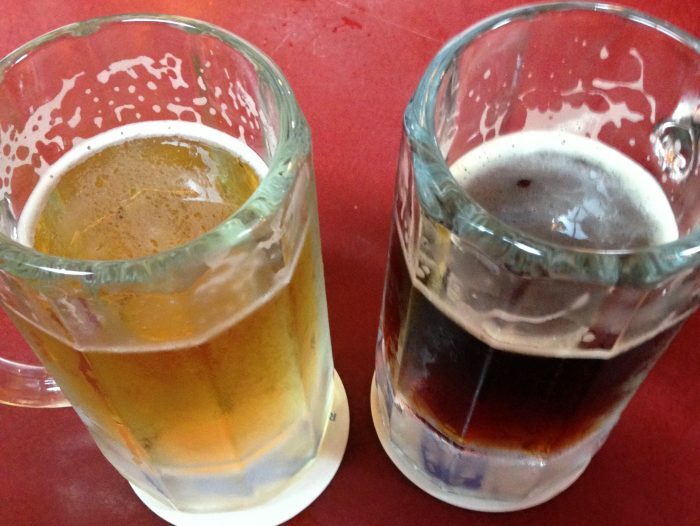 Along with the traditional Italian Birra Moretti is the much harder to find in the U.S. Moretti La Rossa. It is a full but refreshing doppelbock lager with a hint of coffee and hops to cut through the rich cheesy pizzas. There is also the ubiquitous Bud Light that, when served in a frosted mug, is legitimately one of the coldest beers I’ve ever had. I've been a fan of Disney films and television since before I could read or write, I've been visiting Walt Disney World whenever possible since 1993 and I've been obsessively vacation planning since I bought my first Unofficial Guide in 1999. When I'm not blogging, I'm a radio host, event DJ, and professional travel planner. I'm a fan of Patriots football, Yankees baseball, professional wrestling, cold beer, hot wings, and Aaron Sorkin. My wife and I watch Friends reruns every night on Nick at Nite and clap along to the theme song every time. Even our puppy thinks we're goofballs. Neil is on the mark. Also, love the Calamari! Lightly coated and delicious.